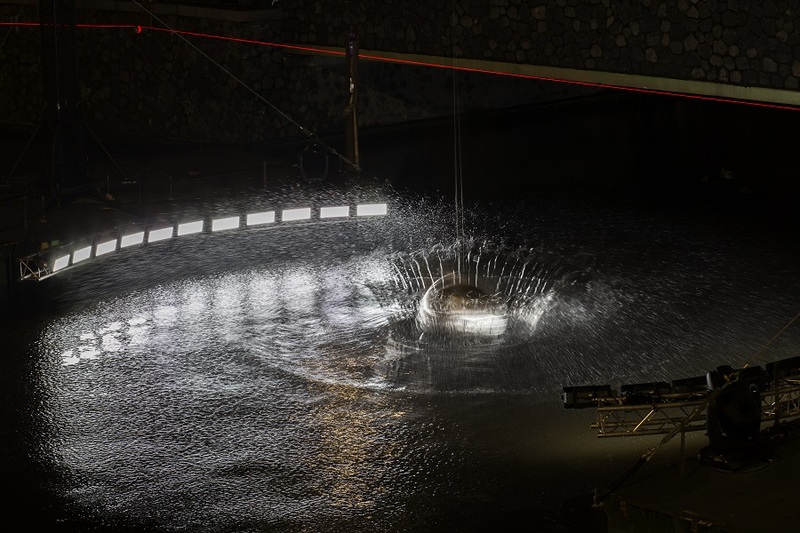 In Floriaan Ganzevoort’s installation Make a Splash (2017) transition, and specifically that of standstill and emptiness into action and energy, plays an important role. 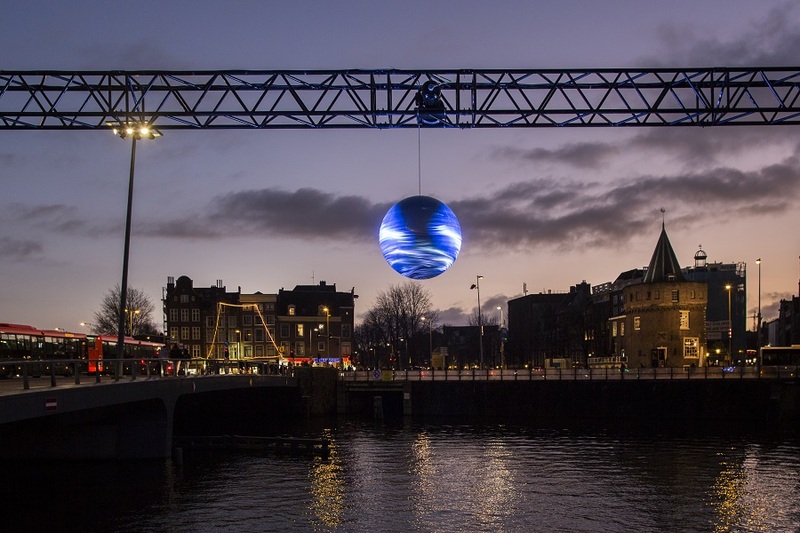 The main element, a large sphere, hangs threateningly and quietly above the water and appears to radiate bright, pulsating light. Suddenly the light goes out, and after a moment of silence and darkness the ball falls into the water with a big splash. The flashing light of stroboscopes ensures that the splash, with dramatically splashing drops, seems to be frozen in different stages. The light slowly becomes calmer and you see the ripples in the water slowly expand, until the sphere is lifted up again. In each cycle, the sphere may take a different shape Are you looking at the sun, a supernova, lightning or a crashing comet? Ganzevoort leaves that up to you. He creates his own mini-universe, in which an explosion of energy as a Big Bang suddenly creates time and space, and reminds us of the importance of light for our human existence. Floriaan Ganzevoort (1975) conducted extensive research into the effect of light during his Theatre Studies at the University of Amsterdam. Since his graduation he has been making light designs for various theatre, dance and music performances. He is one of the five partners of the Theater Machine collective, which provides light for both theatres and museums. Although a lighting design for a theatre performance is very different from one for a museum space – in the first the light moves, in the second the viewer – Ganzevoort combines aspects of both in his autonomous work. Transition and the interaction between light and space are recurring themes.